Don’t I get any say in my treatment plan? Is there a place I can be seen and heard while also getting the best medical care? When we’re caught in the throes of disease, it’s easy to become focused on the symptoms. We want to feel better. We want to be free of pain. It’s often why we seek medical treatment in the first place. But we are so much more than our symptoms. We may find ourselves running in circles, visiting specialist after specialist with no answers or trying treatment after treatment with no improvement. One person might become frustrated and angry, another might feel forsaken and that no doctor cares, while another feels a sense of hopelessness that recovery will ever come. We may also find ourselves exhausted or overwhelmed from all the information or treatments we’ve had to do to fight or treat the condition. The long and short of it is Illness often contains a stress component. A naturopath sees each person as a multifaceted individual and treats all of those facets as an integrated whole. As we begin to feel whole again, that wholeness then becomes a wellspring of power, allowing us to achieve greater levels of healing than we may have thought possible. Every person is different, from the genes that determine our physical makeup to the cultural influences that shape our minds. Deep down, we crave to be known and honored as the unique beings we are. When we feel respected for our differences, we begin to trust. A part of us is able to finally relax, opening the door to deeper healing. Needs. Our needs are some of the most powerful expressions of who we are. When they aren’t met, we suffer—and so does our health. In the course of our tangled and harried lives, it’s easy to become so disconnected from our needs that we no longer recognize them. Desires. Our desires stem from our emotions, and they can tell us a lot about ourselves: what we dream, what we fear and what the soul longs for. When our desires are heard and respected, we feel empowered and strong. When they’re brought into alignment with our needs, we become balanced and whole. Beliefs. As we progress in life, we develop a set of beliefs around our experiences. These become a lens through which we see the world, coloring our perceptions and influencing our decisions. Beliefs can be nurturing and uplifting, such as belief in a higher power, or they can be harmful, such as a negative belief about ourselves. Lifestyle. Our lifestyle consists of the choices we make about the things we do on a regular basis—what we eat, where we live, who we surround ourselves with, how much sleep or exercise we get. Necessity and external circumstances can sometimes limit or influence our choices, as can our mental or emotional state. A naturopathic physician helps the patient adjust the lifestyle factors that can be changed while working within the patient’s limitations. Choice. When our individuality is honored, we reconnect with our own inner guidance. We become active partners in our own healing. Feeling like we have options and are empowered to choose our own way can make all the difference. Natural medicine gives you additional options. A naturopathic physician can provide the same excellent standard of care you would get from any medical physician while offering a vast array of alternatives. It starts with getting to know you and your condition well. Then a naturopathic physician will present important information about both the standard of care and the alternatives. You’ll be able to discuss the pros and cons of each option together. You can also get information about what you might be able to expect with each option. You’ll be able to ask questions to clarify why a recommendation is being suggested as well as, bring up any concerns you might have. Together you and your naturopath have the opportunity to discuss which options you have resistance to and why; as well as, which options you resonate with. Once the provider understands these things it allows you and your provider address and process these issues so that you both understand them better and can make decisions to meet your needs as a whole person. Once you and your provider have all the information needed you will be able to tailor your treatment plan to meet your individual needs. This allows you to feel as sense of peace and empowerment that you are making the best choice for your health as a whole. The naturopath seems like a good fit. 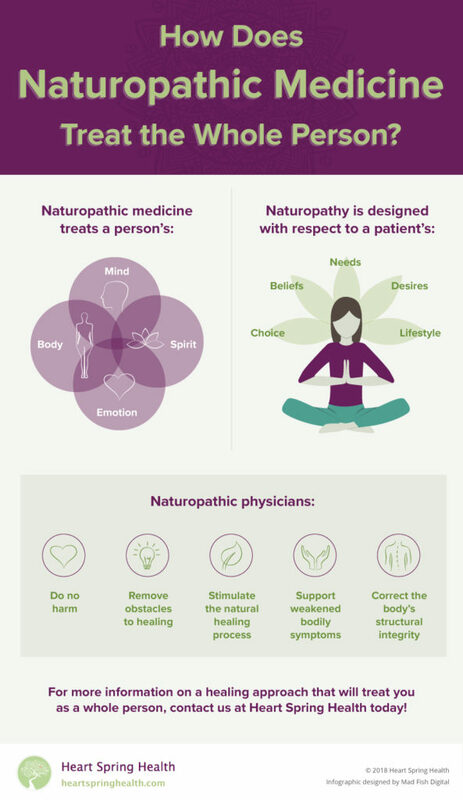 The naturopathic clinic feels like a healing place to you. They’ve helped other people with conditions like yours. The visit resolves into a relaxing experience. You feel optimistic and uplifted about continuing. Are you ready for a healing approach that treats you as a whole person? Call Heart Spring Health’s Portland naturopathic clinic for an initial visit today at (503) 956-9396‎ or fill out our online form.